Located at 706 Camino Lejo on Santa Fe’s Museum Hill, the Museum of International Folk Art is part of the state of New Mexico museum system and a division of the New Mexico Department of Cultural Affairs. The museum holds the largest collection of international folk art in the world, numbering more than 130,000 objects from more than 100 countries. The core collection of 2,500 objects was donated by museum founder Florence Dibell Bartlett. Since that time, the collection has been shaped in large part by the generous support of individuals, most notably Alexander and Susan Girard, with their gift of 106,000 objects, and Lloyd Cotsen’s Neutrogena Collection, consisting of 2,600 exceptional textiles and objects. Our collection continues to grow according to the belief that through the traditional arts, we may illuminate human creativity and shape a humane world. The museum is also family friendly, with multisensory experiences and a designated play area for kids. Admission fees are modest. For New Mexico residents, fees for adults and seniors 60 and older are $7; student fees are $6. Admission is free for children 16 and younger. Free admission for all New Mexico residents is available on the first Sunday of each month. Seniors are admitted free on each Wednesday. For nonresident adults and seniors, admission is $12; admission for students is $11, and for children 16 and younger, it’s free. Come join us for Thanksgiving at Inn on the Alameda! This savory feast includes your choice of delicious traditional favorites, including perfectly-roasted turkey with gravy, golden whipped potatoes and other side dishes, as well as assorted holiday pies. No trip to Santa Fe would be complete without a visit to the city’s famed historic Plaza, and we highly recommend making the historic Palace of the Governors part of your visit. We highly recommend exploring Santa Fe’s art museums while you are here, particularly the work of artists who lived and worked here. One such artist, Gustave Baumann, lived in Santa Fe for more than 50 years and became widely known and appreciated for his work in color woodblock prints. 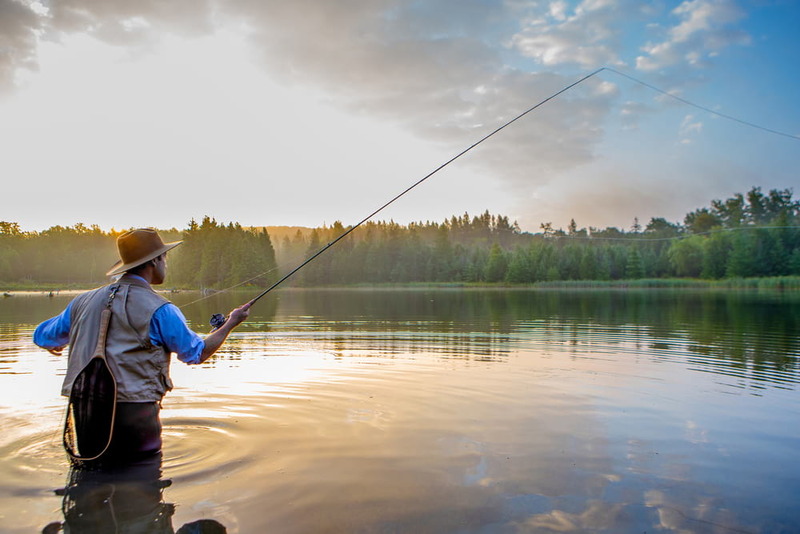 If you love to fish, Northern New Mexico may be your dream vacation. The Pecos River is an excellent location for both fly fishing and regular cast fishing, offering incredible fishing options just a short drive from Santa Fe. The Pecos River is known for its Brown Trout, Rainbow Trout and Rio Grande Cutthroats. The river has benefited from extensive restoration and rehabilitation to restore native trout, helping make the Pecos a great place to fish in almost any season. From the headwaters high in the Sangre de Cristo Mountains, this cold, clear water flows 926 miles before it empties into the Rio Grande in Texas. The Browns run wild, and the river is continually stocked with Rainbows, making this a prime fly fishing location. We recommend checking out the Orvis fishing report here for the most up-to-date information on weather, water and fishing conditions. The Pecos offers some truly exceptional waters for casting in a beautiful setting. Let us help you plan your fishing trip. To learn more about the Santa Fe area, or for help planning your trip to Inn on the Alameda, visit our website. White Rapids in the Desert! Here in the arid Southwest, people naturally think of the desert. And while New Mexico boasts some of the most striking desert landscapes and scenery in the country – white-water rafting is also prominent. In fact, this region boasts some of the finest white-water rafting in the country! With outings available for every skill level, white-water rafting represents an ideal way to cool off during the hot summer months! The Racecourse is New Mexico’s most popular rafting trip. This half-day trip is ideal for beginners or rafters who have limited time available, while providing exhilarating, extended white-water runs. This trip is usually Class II-III but goes to Class IV when the water is high. This outing is suitable for nearly all ages except during periods of exceptionally high water. The Rio Grande Gorge Full-day rafting trip features lush habitat scenery along the Orilla Verde section of the Rio Grande. A calm first-half float allows rafters the opportunity to enjoy the scenery. After stopping for a riverside lunch, the second half features the exciting Racecourse white-water runs. The minimum age for this trip for most of the year is 5 years old, which makes this a fun outing for the entire family. This multi-day rafting trip is regularly available for most weeks from April through August, thanks to regularly scheduled releases from El Vado Reservoir. This trip covers 33 miles through sandstone and limestone canyons on the river, starting outside of Tierra Amarilla and concluding at Abiquiu, a renowned artist village. The spectacular scenery along the route includes desert cliffs and beautiful pine trees reminiscent of the work of New Mexico’s own Georgia O’Keeffe and outdoor photographer Ansel Adams. These are just three of several white-water rafting outings accessible from the Santa Fe area. Boston represents many things to American history: from its beginnings as a valuable trading port, to its role as a cradle for the American Revolution. Boston remains an historical conduit to those early years of our nation, with its access to European markets and its own evolution of a fiercely independent identity. Taos, however, remains much less well known than Beantown, but in the roles both cities have played throughout the development of this country, we will find many points of comparison and variance. At one time, Taos and Boston were both tiny outposts of the New World. This story is about the vast differences in each city’s development through trade. If you lived in New England in the late 17th and 18th centuries, Boston would have been one of the major ports where you could receive or ship goods back and forth to Europe. If you needed hinges or locks, woven fabric or clothing, leather saddles and harnesses, or brass candlestick holders and china, these important items were just 60 days away. Place any special order through a broker, come back in 2 months and pick up these valuable goods right at the dock. Stores for these goods lined the streets around Boston Harbor and you might be able to just walk in and purchase them on the spot. From Savannah to New York to Providence, the same opportunities existed all along the Eastern Seaboard for ready access to European goods. Yankee ingenuity, thrift, and mercantilism thrived and were crucial to the growth along the east coast of America. Hardiness, grit and determination necessary to survive those East Coast winters helped contribute to the strength of the region. In addition, the ability to order and receive European manufactured products by ship, and the convenience and speed with which to receive them, gave New England the leg up necessary to lay the foundations of what would later become the seat of the American Industrial Revolution. In the 17th century, as the east coast identity was forged, a contrasting selfhood was taking shape. In the Spanish province of New Mexico, at the very end of the Camino Real in the little village of Taos, colonists in this part of the New World faced a completely different set of challenges. While early trade and settlement in the eastern seaboard relied on rivers, waterways and the sea, the exchange of goods and ideas in New Mexico was oriented along land trails – most notably the Camino Real. This comparative isolation would prove important in the forging of a unique New Mexican identity. In the case of trade, the landlocked route meant a much slower pace than the swift waterways oriented east. To even arrive at a port required a difficult overland journey. Retail orders would be relayed with caravans and itinerant merchants, resulting in periods of uncertainty. When, at last, an order arrived in Veracruz, a ship had to travel to Cadiz, Spain (a longer voyage than from Boston to England), and return with the goods that would begin another 6-month journey north. So, here is the reality of Taos New, Mexico. The Martinez Hacienda, today a living museum, is an example of life in the provinces of Nueva Espana. The hacienda was a walled fortress, big enough to bring all of the livestock and servants into its giant 2 center courtyards whenever Comanche or Apache Indians attacked. The isolation from colonial sources of wealth and protection inculcated a need for self-reliance for the necessities of survival. The Martinez Hacienda showcases the necessary structures used to develop the specialized divisions of labor inherent within the social structure. Around these courtyards was a veritable “streetscape” of “shops” – so to speak. Each room had its own job to perform: the grinding of grains, the blacksmithing of hinges and locks, the weaving of clothes. Wood carvers, furniture makers, leather tanners, saddle- and shoe-makers, potters who made the kitchenware and silversmiths who crafted everything from candlestick holders to the jewelry worn by the heads of the household. Both men and women – hat makers and vintners alike – made up the complex machine that was the early structure of this western city. Everything necessary for life in the wilds was within reach because of the hard work of the community that was a separate world of its own, with no ready access to Europe or its manufacturing power. Spain for hundreds of years forbade any trade with the developing United States, thereby increasing and prolonging Nueva Mexico’s dependence on itself for almost everything. It was not until 1821, with Mexico’s independence, that trade along the Old Santa Fe Trail began – bringing American goods swiftly from Missouri to New Mexico. In fact, European goods traveling up the rivers from New Orleans reached New Mexico faster than they could travel from Durango, Mexico to Santa Fe. Imagine the difficulties experienced by the many generations of Spanish colonists from the Conquistador Onate’s arrival in New Mexico in the 1590’s until 1821 when the Old Santa Fe Trail opened up. Our historical account of Taos and Boston – one city bound by land and the other positioned within the fluidity of water – will hopefully provide you with an understanding of each locale’s distinct path to become the iconic places they are today. Boston’s easy access to European markets and their position along the Charles River ensured that a thriving society, based on trade and resource extraction, could develop. A Cosmopolitan city, in conversation with European intellectuals, could foster its own educational institutions and philosophies. And it was the voracious demand from a wide variety of markets for goods transported through Boston that ensured the city grew to become a hotbed for independence. When England attempted to retain greater control of Boston’s economic interests, it led to the beginning of the American Revolution. Taos, meanwhile, developed quite differently. Due to their landlocked isolation, movement of their goods was heavily restricted by overland trade, making tax collection easy for the colonial Spanish government. The self-reliance found in the Martinez Hacienda showed the immense resourcefulness and the intricate filling of roles, but it limited opportunity for industrial development. While Boston’s access to the interior of the nation and the waterways of the world bred independence, the isolation of Taos ultimately ensured dependence upon Colonial authorities for access to wider markets. Sure, the Yankees with their Clipper ships were a hardy bunch of fellows, but the Martinez’s of Taos, and the many hundreds of other colonists, survived and prospered in a part of our country countless times more remote and isolated than the Boston of the early 18th Century. Studying the history of the two cities provides us with an opportunity to see the ways in which settlement shaped the identities of the many disparate elements that, today, define America. Taos is just a short jaunt north from the Inn. Read about the western city that has become a Mecca of sorts for many who wish to connect with the history of the land and the perseverance of the people who forged its path. All Inn on the Alameda blog posts are written by Joe & Michael Schepps. Read about the authors here. The snow has come to Santa Fe, and we are delighted! More snow is predicted for the holiday, and we may even have that fabled White Christmas. Ski Santa Fe opened on December 15, a little later than the hoped-for Thanksgiving opening, but with real snow, no one is complaining. As of today, 31% of the ski area is open, with a 39″ base, and driving conditions up to the ski area are fine. Currently, the price of lift tickets has been lowered, but of course, that can and probably will change, as more terrain is available to ski. And there’s a webcam too, if you want to see the mountain first! In terms of rental equipment, you can stop on Hyde Park Road on the way to the ski basin and check out Cottam’s. In town, Alpine Sports is conveniently located on Sandoval and Water Street, same location for years. Santa Fe Mountain Sports is in a new spot in the Baca Street portion of the Santa Fe Railyard. And Ski Tech is an easy in and out on St. Francis Drive, just north of Cerrillos Road. Snow Makes a Sunset Dramatic! Skiers with a yen for more dramatic conditions can head to Taos Ski Valley, about 2 hours north of Santa Fe, and rentals are available right there. Taos is open to the top of the mountain, with a base of 24″. If you are already in New Mexico, you can even demo new equipment on Demo Days, Friday and Saturday, Dec. 19 and 20, from 10 a.m. to 3 p.m. at the base of lift #1. And if your ski vacation is planned for the new year, think about timing your visit so that you can enjoy the Taos Winter Wine Festival! Just be sure to be back at the Inn in time for our complimentary wine hour. After a day on the slopes, you will have earned it! Nearly ever year, sometime around the end of October, Santa Fe gets its first little snowfall to let us know that winter is on its way. This year the reminder came a little earlier, the weekend before Halloween, and the more turbulent conditions up in the mountains put a quick end to the colorful aspen leaves. We had a week’s respite of wonderful weather here in town, but by last weekend another storm swept through, and as far as the highlands are concerned, winter is officially here.